Marketing is definitely an important aspect of reaching more people, but it doesn’t revolve on its own. For example, you can’t simply send invites out for a dinner party but not plan or prepare food for it. You also can’t leave your house a mess or forget to set the table. Your invites might get people to your house, but you can’t expect them to eat. 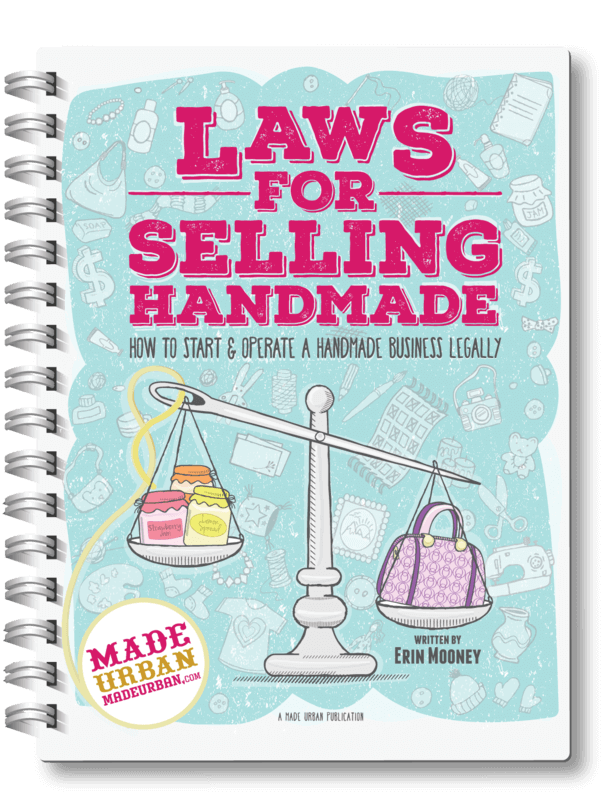 We need to think about your handmade business in a similar way and stop focusing on marketing alone to do the job of boosting sales. Your marketing may get people to show up at your craft show booth or Etsy shop but if you haven’t prepared products that are relevant to what they currently want/need, or created a setting that encourages buying (i.e. well designed shop or craft show display), you can’t expect them to buy. Each area of your business (create, market, sell) must be on-point if you want to turn more people into customers. With this idea in mind, we’re going to look at the third and final factor that must be in place before someone will buy, and how you can ensure each area of your business (create, market, sell) is appealing to that factor. Please read PART 1 and PART 2 for buying factors #1 & #2. Have you ever decided NOT to buy something because the checkout lineup was too long or the customer service was bad? When shopping online, have you ever put something in your cart but then questioned if it’s safe to enter your credit card number, if your item will arrive on time, arrive at all, or arrive looking as good as it appears in photos? Cart abandonment is a real problem y’all. It varies from 60% – 80%. That means 60% – 80% of people who put your products into their online cart, decide not to buy! Although those stats apply to online shoppers, people shopping in person are also contemplating purchases, and can easily talk themselves out of one. Let’s look at how you can help alleviate some of these worries and keep your shoppers feeling good about their decision to buy. Here’s how you can work on step one (create) of your business, to appeal to buying factor #3: they feel good about buying. In general, consumers should feel good about every aspect of your products. Imagine a bar of $10 soap sold in a Ziplock bag and the price written on it with a Sharpie. Would you feel good about paying more than double the price you might normally pay for a product being sold in a sandwich bag? You must know who your ideal customer is and make sure all the touchpoints of your products appeal to them. From your product names, materials/ingredients, price, tags, packaging, etc. All of my soaps would be cruelty-free and advertised as such on labels, in product descriptions, etc. Someone who loves cats is going to be drawn to every element of my products. And each element keeps the excitement and good feelings going. This is why it’s important to know what your USP is, who you’re specifically targeting, and apply your brand across the board. BEAT LAST YEAR’S SALES will help with that. Now let’s look at how to specifically address some of the issues that can change a shopper’s mind. Building trust with your customers starts with your products. As I mentioned in part one, too much selection can make consumers question your merit. One can’t be an expert at jewelry making, soap making, candle making, sewing, AND operating a business, especially when doing so part-time. 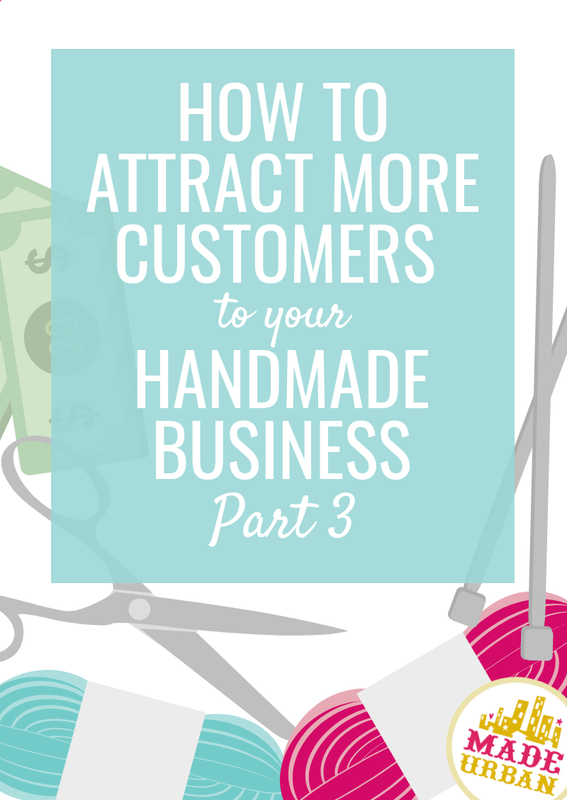 Being handmade means your products take longer to make, and therefore, you must charge more. Consumers don’t want to pay more than they would at a big-box store to buy a product that looks like a craft project. They’re paying for the level of expertise someone has within a craft (e.g. a soap maker who has spent years learning how to make soap), as well as the superior quality and attention to detail handmade items are associated with. Gain trust by showing shoppers you’re not just throwing products out there to see what sticks. You’re focused on one craft; perfecting it, being passionate about it, and putting out the best product. You must charge what you need to charge to earn a profit. So you should never lower prices solely to increase the chances of gaining a customer. However, your prices should be on par with your competitors, or, you should be offering something different than your competitors to charge a different price. Shoppers may wonder why one soap vendor’s prices are so much lower than others’ and question if there’s something wrong with the lower-priced soap. They’ll also question making a purchase if prices are higher for no apparent reason. For example, I might be willing to pay more to have my car fixed if the service comes to pick up my vehicle and drops it back off. But if they’re simply charging more for the same service another mechanic is offering, just because they can, I’m not going to feel good about paying a higher price and will go somewhere else. Make sure your products are priced right for what they offer and what your ideal customer is expecting. If you need to get your pricing down to be competitive, check out WHAT TO DO WHEN YOUR PRICES ARE TOO HIGH. The best way to prevent shoppers from changing their minds or needing to “think about it” is to offer something they can’t resist. If they think there might be something better out there, something similar for a cheaper price, etc. they’re going to do their research before buying. If they’ve never seen something like the product you’re offering, they’re going to feel like they have to have it…now. When I came across the water bottle that tracks how much water you’ve consumed and notifies you when you need to drink more, I had never seen anything like it before. I didn’t need to think about it or search the web for the same product at a cheaper price. You don’t have to invent a product that’s never been heard of, you simply need to know what you do differently from the majority of your competitors (your USP) and do it differently in the best way you possibly can. If shipping fees are higher than shoppers are expecting, they may get to the final stages of your online checkout and decide to back out. To prevent this, you may consider adjusting your prices to include a portion of shipping fees. There have been several times I’ve put an item in my online shopping cart and then changed my mind because the shipping fees were almost as much as the product. If they had taken a portion of that shipping cost and worked into the product price, I’d feel more comfortable completing the purchase. It would be the same price in the end but it feels better paying $15 for an item and $5 for shipping than $10 for the item and $10 for shipping. You feel like you’re getting more value by paying for a product than paying for shipping. This won’t work for every business but consider if you can work some additional fees (e.g. shipping, gift-wrapping, etc.) into your product’s prices, so there isn’t as much shock at the checkout. Here’s how you can work on step two (market) of your business, to appeal to buying factor #3: they feel good about buying. Marketing is an easy place to throw a shopper off. Sometimes we feel we need to go into sales-mode when writing a social media post, newsletter, or press release that’s promoting a product. The first mode allows your excitement to come through, words to flow naturally and for consumers to see the passion you put into your product, which is infectious. When you’re trying to sell, that comes across to the consumer. Being overly “salesy” makes people feel like they can’t trust you, and that’s not a great place to start. You also want your marketing to reflect your brand. If your marketing sends one message and they show up at your craft show booth or online store and get a completely different message, that also chips away at their trust in your business. If marketing screams “discount pricing” through quickly snapped photos, thrown together posts or newsletters, pushy tactics, etc., people are going to expect product pricing to be discounted. If your brand sells luxury and sophistication, your marketing should deliver that same message. It also helps if your marketing isn’t always hitting people with the hard sell. As mentioned in Part 2, if you’re always asking your Facebook followers to buy from you, it starts to give them the feeling that you just want their money. Find ways to add value, and not always ask for value. For example, if I was selling cat-themed soaps, I may post a promotional message followed by 2 or 3 entertaining, educational or helpful posts. Post 3 – A tip about why you shouldn’t bathe your cat. Post 4 – I may share a photo of a cat who’s getting the medical treatment they need, thanks to the proceeds I donated from my soap sales. The same idea would apply to your newsletter. Lots of non-promotional ideas here and inside HOW TO START, SEND & GROW A SUCCESSFUL NEWSLETTER. This can also be applied when pitching to the media or bloggers about featuring your products or business. There must be a story behind it that intrigues readers; it can’t be a blatant sales pitch. “Local girl makes soap” is not a headline you’ll find in a newspaper or magazine. “Soap business is helping to save local cats” has more of a story. Here’s how you can work on step three (sell) of your business, to appeal to buying factor #3: they feel good about buying. Your sales channel can be the cause of a lot of changed minds. Let’s look at how to specifically address the issues that cause shoppers to abandon their purchase. Imagine someone selling Apple products in a run-down warehouse. They may be the exact products sold in the clean, modern, well-lit Apple stores, but the warehouse would make you question what’s wrong with the products. The design of your craft show booth or online store should strengthen the value of your products. If it looks thrown together, dated, cheap, etc., shoppers will wonder if your products are worth their price. You also want to have a secure payment system. If shoppers question if their credit card or personal information will be safe, they won’t purchase. Shoppers will question making a purchase when a product’s surroundings don’t match its pricing. You’d expect a white t-shirt to be much more expensive if you came across it in a high-end boutique vs. a thrift shop. Try searching “cheap _________ (name of your product)” and looking at the design of those websites, and then search “high end” or “luxury” or “expensive” with your product name to see the difference in design. The setting you showcase your products in will either lead shoppers to believe your products are worth their price or that they seem over-priced. Design, colors, photos, descriptions, craft show props, etc. should reflect your prices. Many shoppers will leave a craft show table or online shop if they want to see what else is out there before committing to a purchase. To prevent this, try getting shoppers excited about a purchase. When I can imagine where I’m going to wear something, what I’m going to wear it with, who’s going to see me in it, etc., I don’t want to wait to buy, I want it now. How can you paint a picture to help shoppers imagine how their lives will be better when using, wearing, consuming, gifting, etc. your product? It can also strengthen their decision to buy if you show signs of good customer service. At a craft show, be friendly, helpful, communicate customer-friendly return policies, etc. Help them feel they’re making a good decision buying from you and they won’t regret it. Online, reply to emails promptly and have a friendly tone to your website copy. Sometimes we deal with the same issues or get asked the same questions over and over. But we can’t let past annoying situations get in the way of future sales. Never write, “READ THE FULL DESCRIPTION. Items are made to order and require 1 week to create. I won’t answer emails asking how long an order take”. That will definitely make shopper decide not to buy. Also, make sure you can deliver products quickly. When you find a product you love, aren’t you excited to receive it? It takes a bit of that excitement away when you find out you have to wait 2 – 3 weeks to receive it. Displaying reviews, testimonials, guarantees at a craft show or online can also help shoppers feel more assured about their purchase. At a craft show, a shopper may change their mind if they have to wait in a line to purchase or run across the street to an ATM because you only accept cash. Make it easy for people to purchase your products. Online, complications may come up if your website is slow to load, has glitches, if the checkout has too many steps, etc. Many shoppers will change their mind if they have to set up an account or sign in before they can purchase. In most cases, the process of buying should not require more than 1 – 3 steps. As mentioned under Step 1 – Create, you may want to work additional charges into your product prices to avoid the shock of high shipping fees during checkout. Try to keep shoppers aware of additional costs that may be added during checkout. For example, if you charge sales tax, add “+ taxes” to price tags, signage, or website text. Shoppers need to feel good about the entire purchasing process. From first hearing about your products or brand and taking in the details of your products, to walking through the steps in a checkout. Any step along the way can throw a shopper off and make them feel uneasy about buying. Whichever platform you use to sell your products (e.g. craft shows, Etsy shop, website, etc. ), make sure it’s an easy, quick, and clear process to complete a transaction. If you’re selling at craft shows 5 DAYS TO A STANDOUT DISPLAY will help you improve your craft table. I hope you’ve found this article series helpful! Please share any success stories from implementing the ideas, or any questions you have, in the comments. Informative and beautifully written. I get highly excited when anticipating your newsletters. You really outdo yourself, Erin. Currently, I am in the process of creating my soaping business, and your generous gestures of sharing your knowledge is greatly thankful. Cheers! !